The practice of walking to a sacred space for personal and spiritual transformation has long held a place in the British imagination. 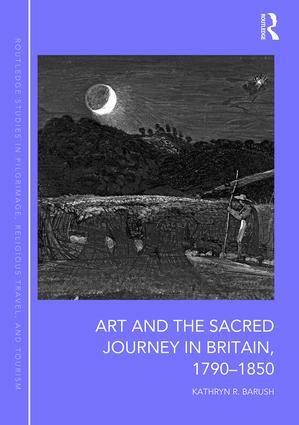 Art and the Sacred Journey in Britain　examines the intersections of the concept of pilgrimage and the visual imagination from the years 1790 to 1850. Through a close analysis of a range of interrelated written and visual sources, Kathryn Barush develops the notion of the transfer of ‘spirit’ from sacred space to representation, and contends that pilgrimage, both in practice and as a form of mental contemplation, helped to shape the religious, literary, and artistic imagination of the period and beyond. Drawing on a rich range of material including paintings and drawings, manuscripts, letters, reliquaries, and architecture, the book offers an important contribution to scholarship in the fields of religious studies, anthropology, art history, and literature. Introduction; Manuscripts, mendicants, and magi: the antiquarian revival of pilgrimage texts and objects, with a focus on the collection of Francis Douce; Saints and symbols: pilgrimage and the theology of ‘things’; ‘Every age is a Canterbury pilgrimage’: William Blake as pilgrim and painter; Pilgrimage and the art of ‘the ancients’; The road to ruins; Conclusion: ‘the road goes ever on’; Bibliography; Index. Kathryn R. Barush is Assistant Professor of Art History and Religion at the Graduate Theological Union and Jesuit School of Theology of Santa Clara University.